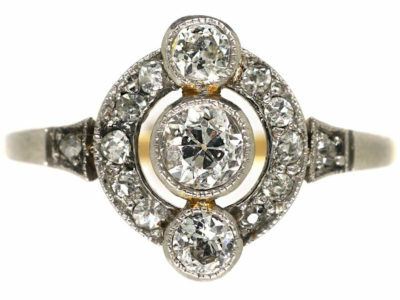 From the bright geometric Art Deco patterns of the Roaring Twenties to the bold, sparkling rocks of the mid century, we've gathered a collection of our most outstanding vintage rings for the year so far. 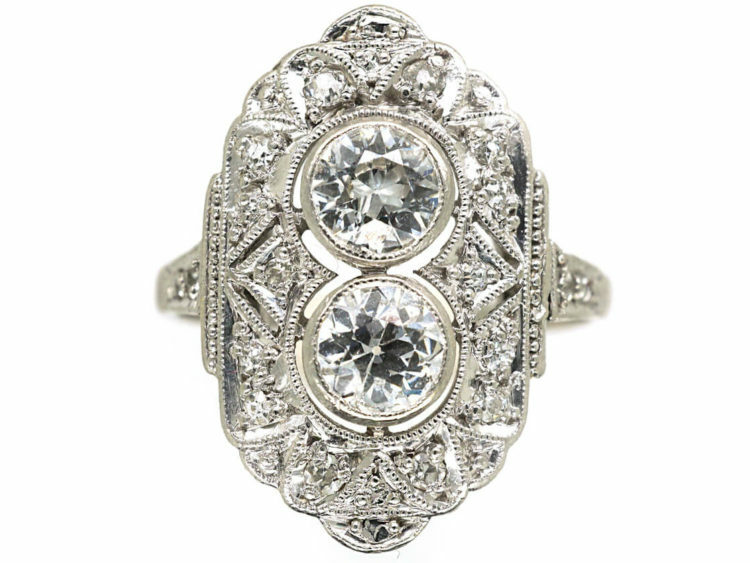 This spectacular diamond and platinum Art Deco ring was made in the 1920s in Germany. Surprisingly comfortable and practical to wear for a ring this size and shape (it sits flat against the finger), it would make an extremely stylish and unusual engagement ring. 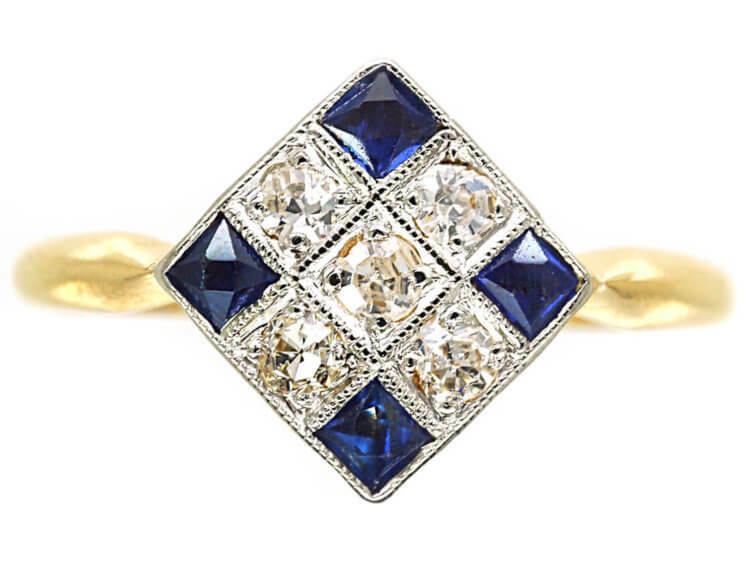 This glorious Mid Century ring is set with three pretty sapphires, surrounded by small diamonds. This is a perfect engagement ring that packs serious punch. It’s a sparkler – beware the magpies! 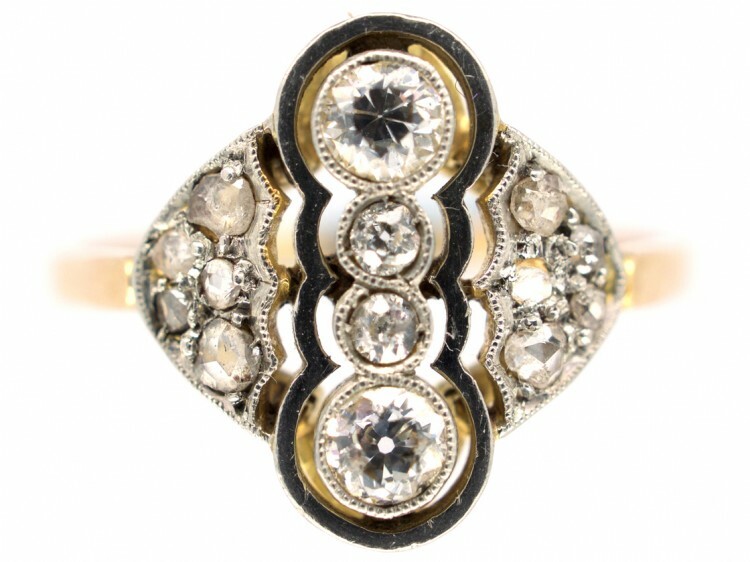 This stunning 1950s diamond cluster ring is fine jewellery’s (extremely elegant) answer to a knuckle-duster. 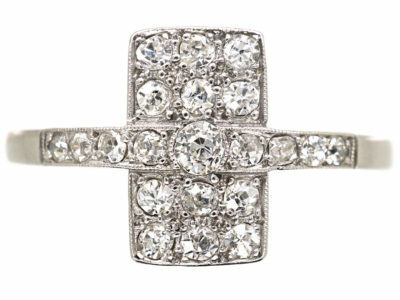 Rising up from the finger, this diamond sparkler is the perfect statement ring and will effortlessly dress up any outfit. 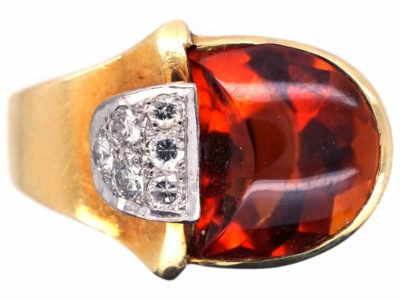 A great cocktail or occasion ring. 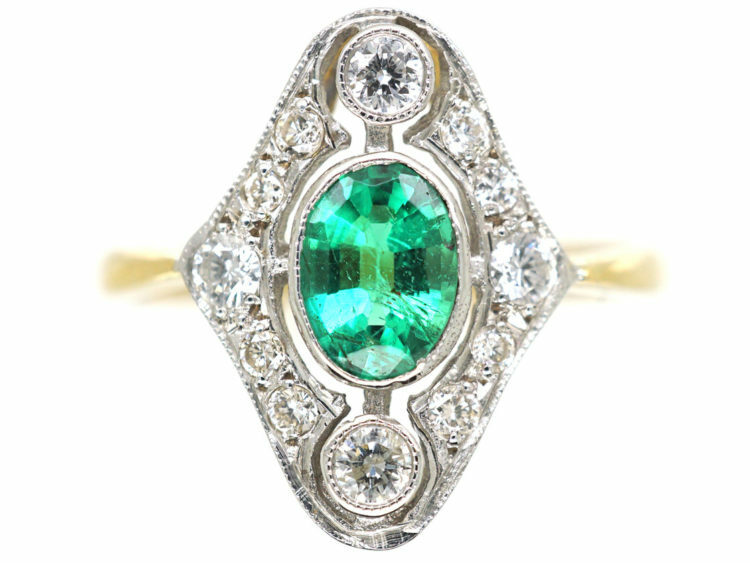 This rare, eye-catching Art Deco ring combines a plethora of specially cut gemstones with several distinctive techniques of its time. 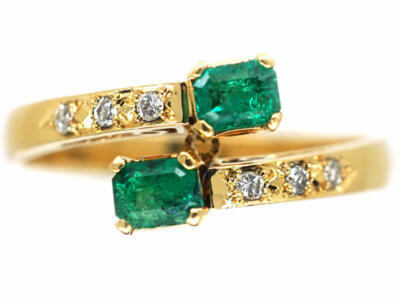 Emerald and Onyx are fashioned into a geometric pattern around a large central diamond. 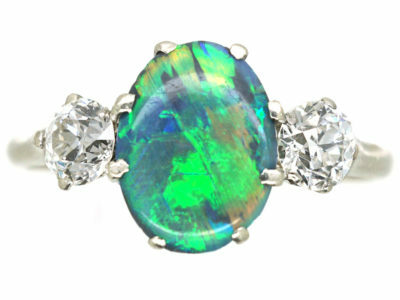 It sits low against the finger so is completely suitable for day to day use or simply as a statement piece. 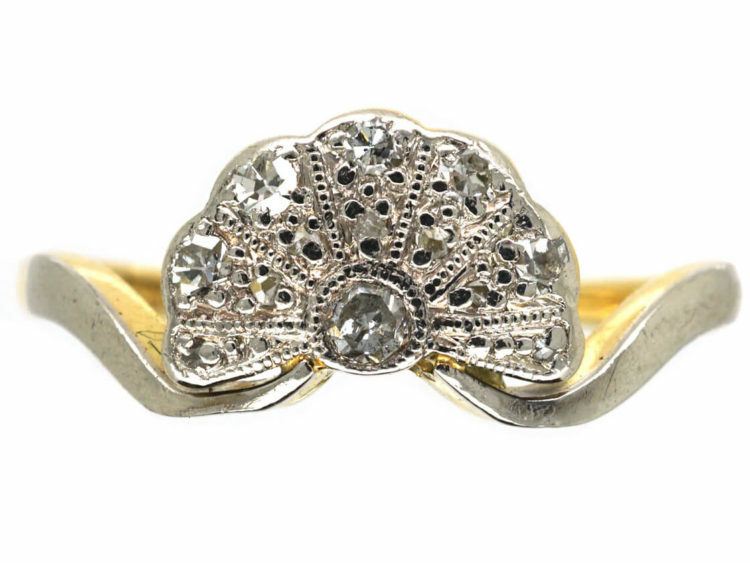 This pretty 1920s Austrian ring is studded with diamonds, large and small. 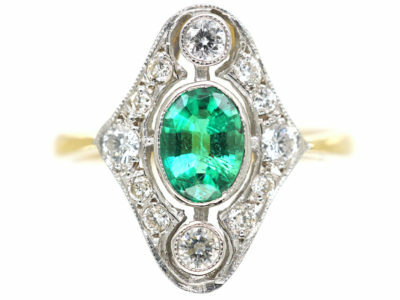 Its striking shape is typical of the Art Deco era. 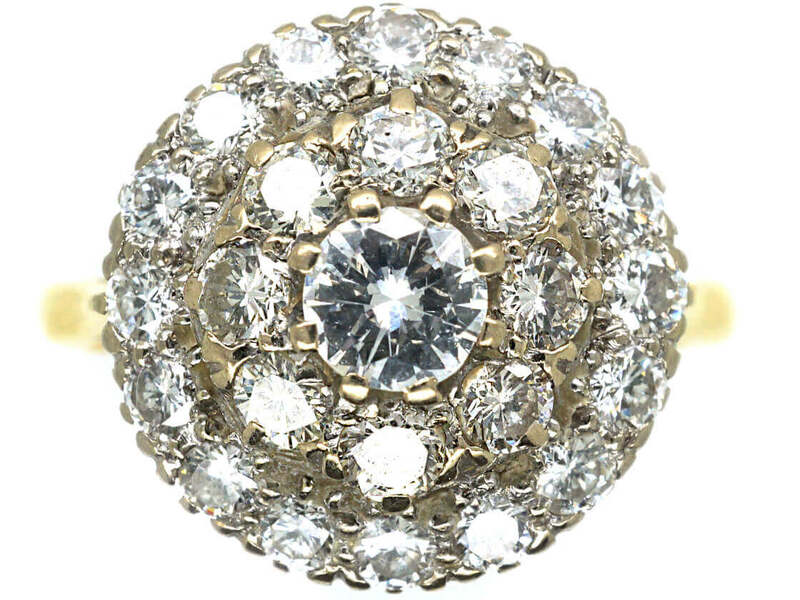 Stylish and sparkly, this would make an ideal engagement ring. 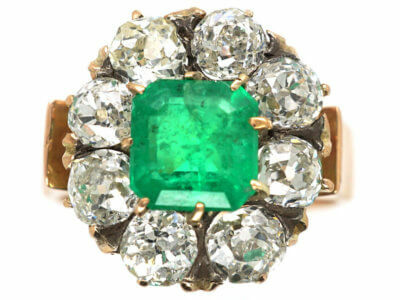 This huge emerald and diamond 1950s ring is a real show-stopper. 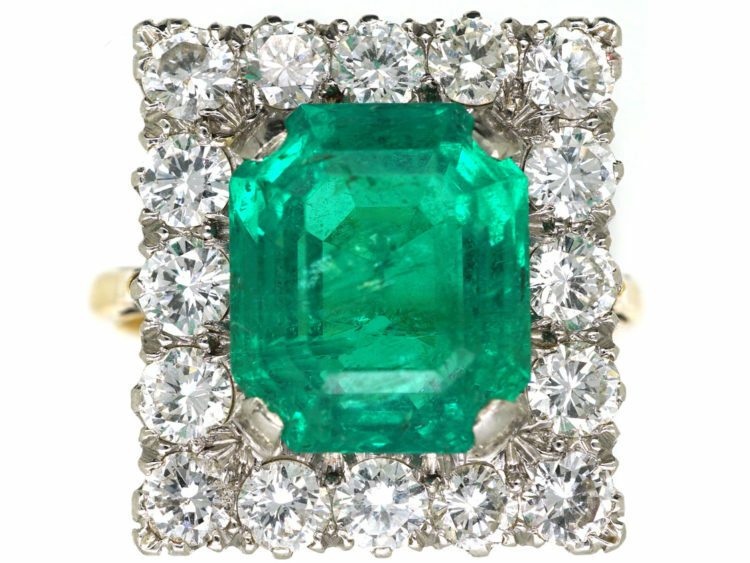 A total of 1.60 carats of diamonds surrounds a whopping and very rare 5 carat raised emerald. 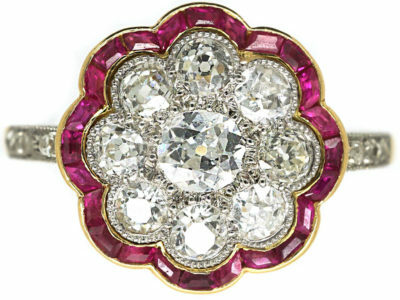 This ring looks spectacular on and is guaranteed to attract a lot of admiring gasps! 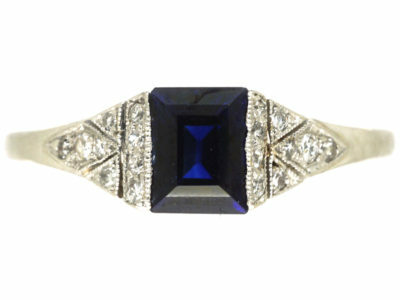 Made around 1920, this Art Deco sapphire and diamond ring strikes the perfect balance between understated and striking. 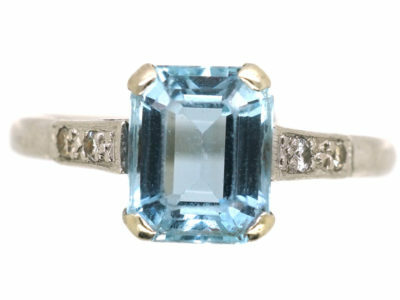 Fashioned from no less than 9 square cut gemstones, this stylish find would make an excellent engagement ring. 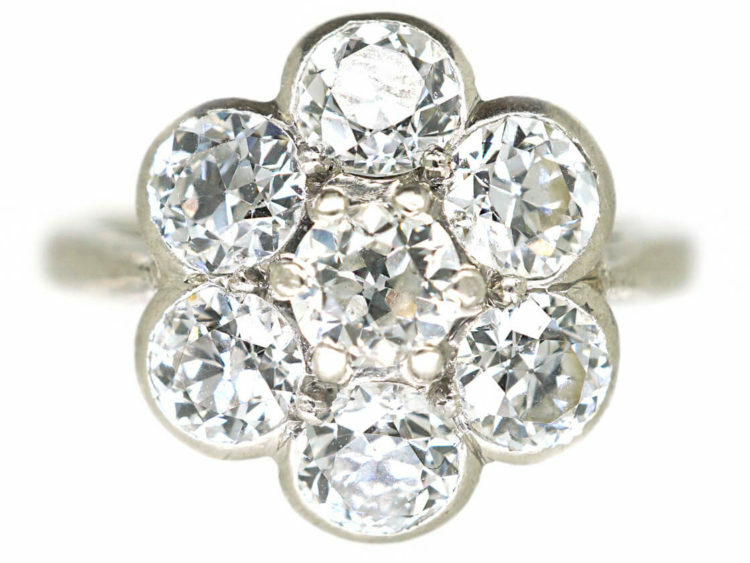 This Art Deco diamond Daisy ring is extremely pretty and boasts impressive sparkle. 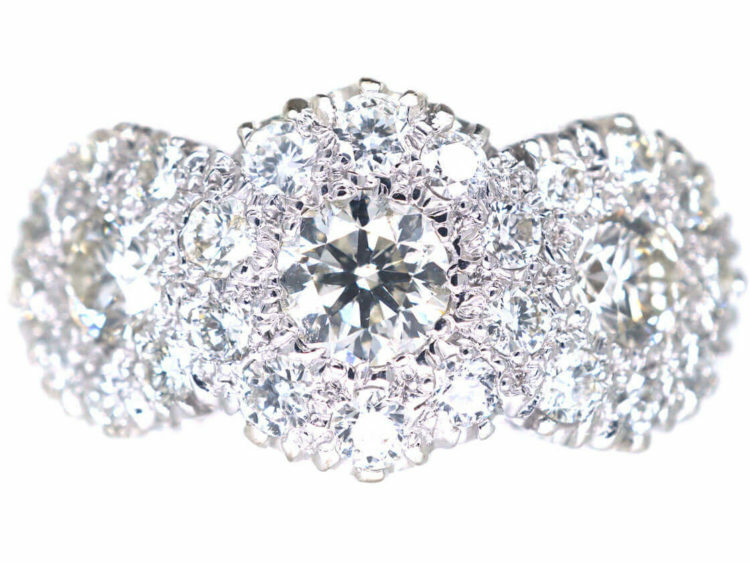 Its generous arrangement of diamonds makes for the perfect engagement ring. 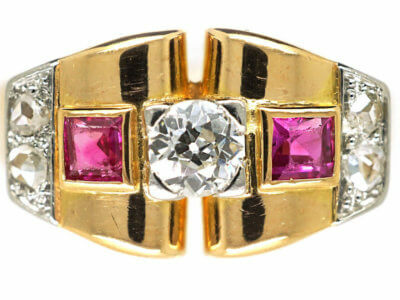 This stylish ring was made circa 1920. With its distinctive pattern and techniques, it is a stunning example of the Art Deco style. 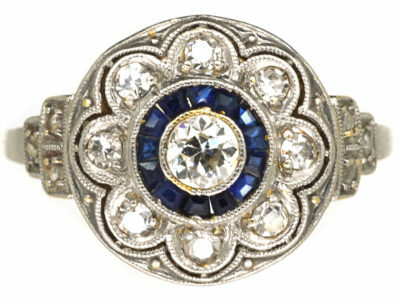 Set with a low, central diamond and surrounded by sapphires and diamonds, this ring offers serious bling and would make a fantastic engagement ring. 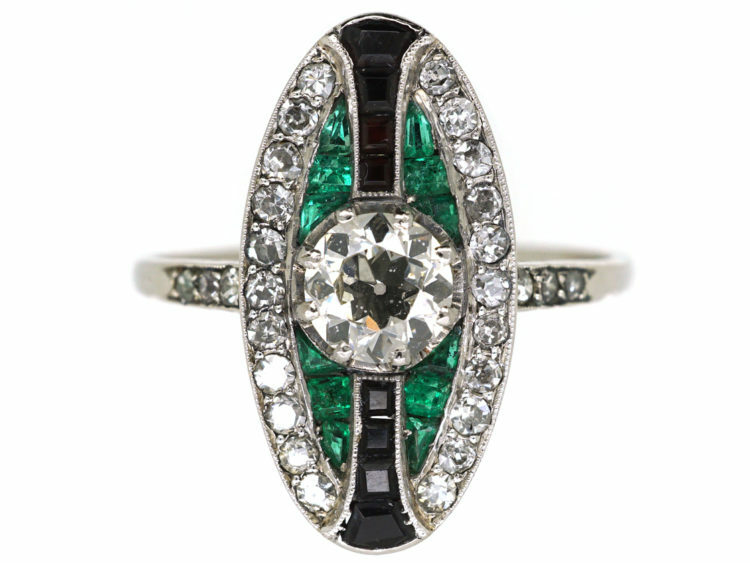 This twinkly 1920s ring has a pleasing, geometric arrangement of diamonds around a large oval emerald. Its well protected ‘rub over’ settings make it ideal as an engagement ring. 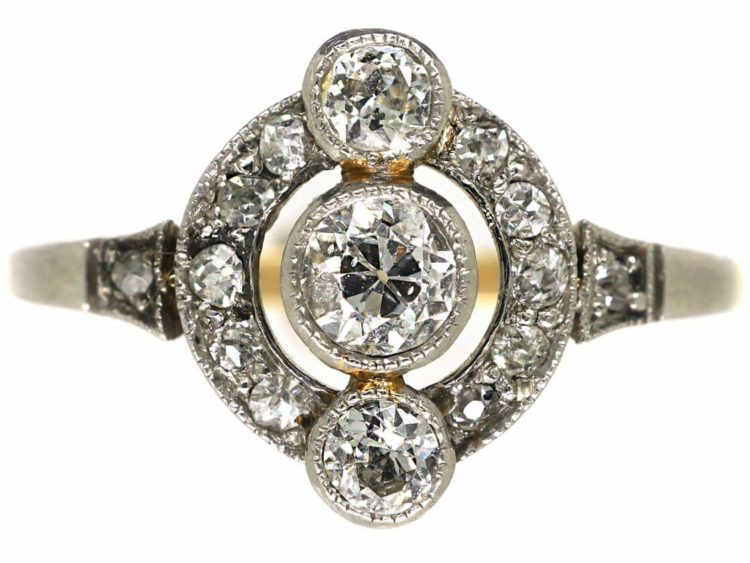 This impressive 1950s ring combines white gold with around 2 carats of bright white diamonds for a brilliant, eye-catching sparkle. 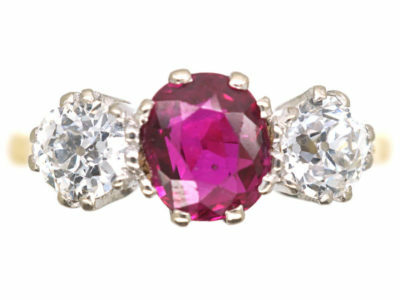 The ring gently ‘hugs’ your finger, making it a practical as well as stunning engagement ring. 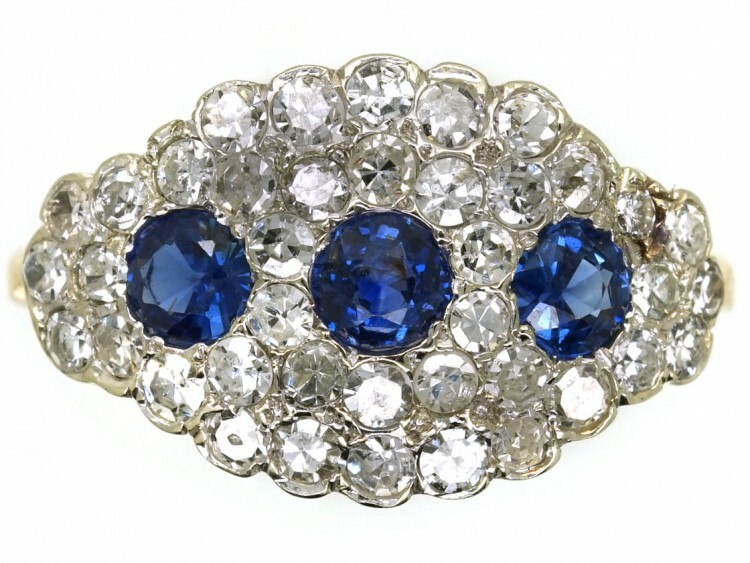 This spectacular oval sapphire and diamond cluster ring was made in France in the early 1920s. 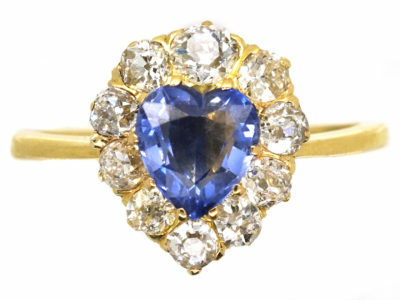 The large natural sapphire is a beautiful, velvety blue and is surrounded by twinkling white diamonds. 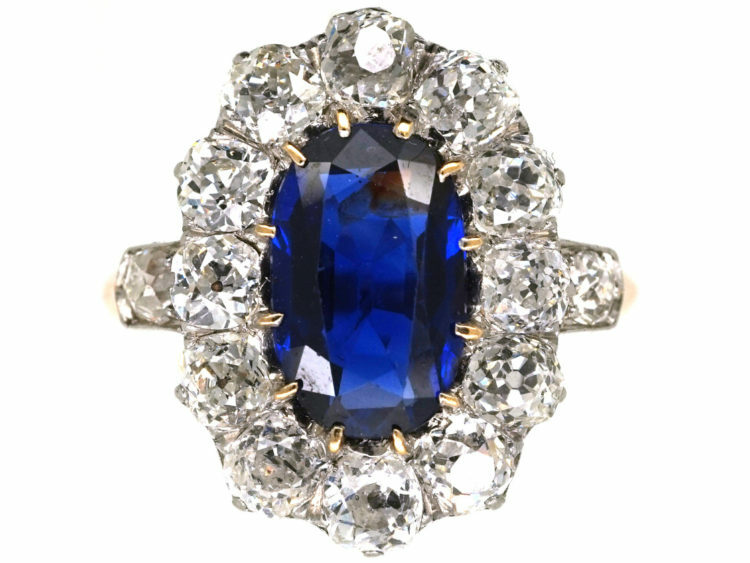 It sits low against the finger so would make an impressive engagement ring, reminiscent of the one worn by Princess Diana and the Duchess of Cambridge. This extraordinary geometric ring combines some serious diamonds. 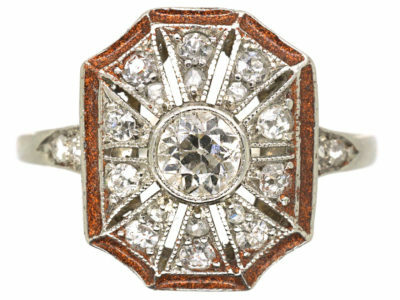 Made circa 1920, this ring is in great condition and is a fantastic example of early Art Deco design. 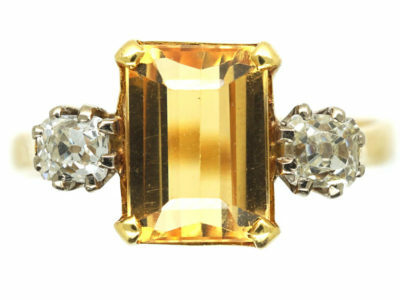 It would make an wonderfully unusual engagement ring or a great cocktail ring. 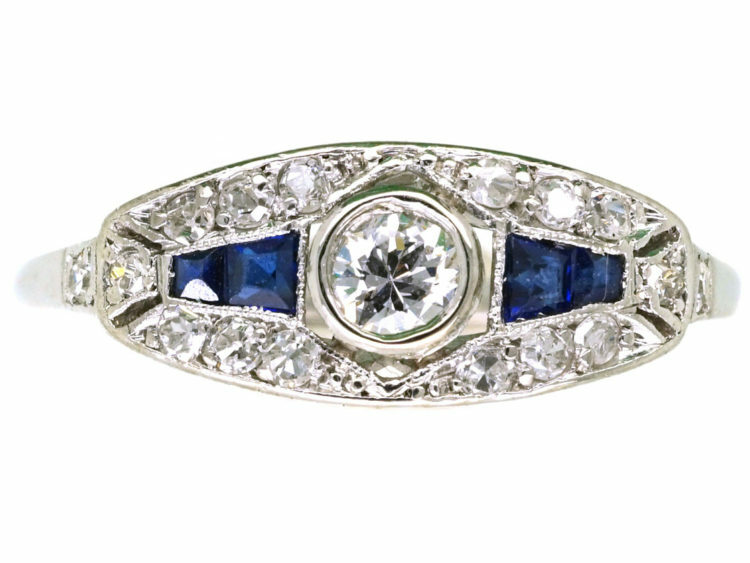 This unusual and pretty fan-shaped ring is typical of the Art Deco period. 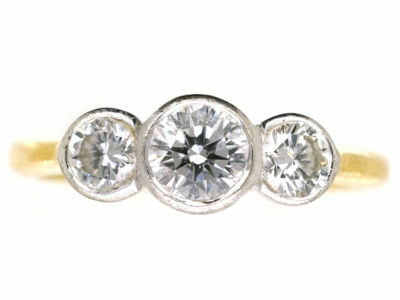 Made in the Roaring Twenties from good white diamonds set into platinum, this ring would make a lovely engagement ring. 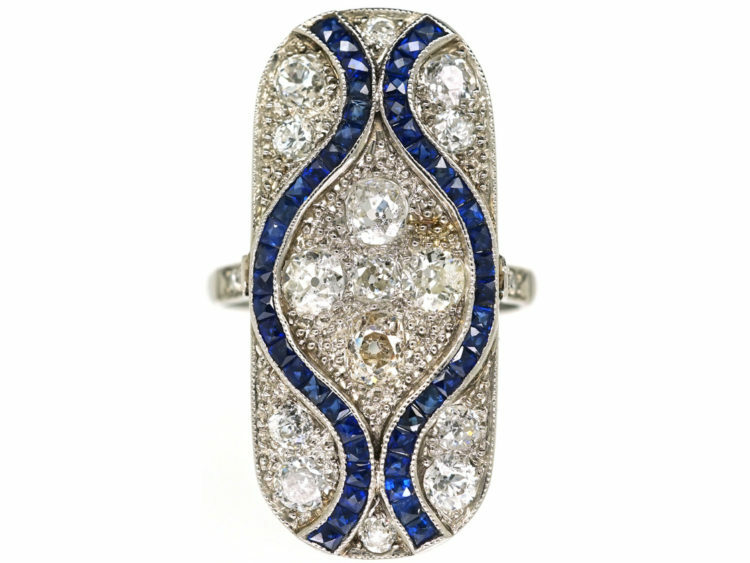 Last, but certainly not least, this flamboyant, large Art Deco ring is set with diamonds and sapphires and combines white gold and platinum – the fashionable white metals of this era. 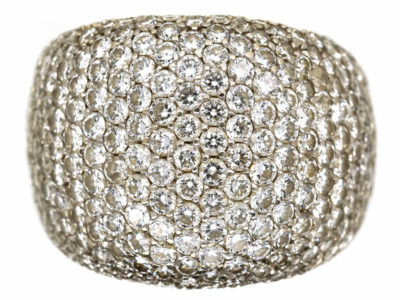 Its bold, curved lines and frosted sparkle effect make it a fantastic and eye-catching cocktail ring. See more images and read all about it here.